A flight is a funny way to start a road trip. I flew out from SeaTac for JFK last night, just before 10PM. Flight has always made me giddy. I love planes, and as frustrating as airports can be, I love air travel. This marks my first time flying JetBlue. Paul has made this flight more than a few times and he sings their praises every time. Since I will be gone for Mother’s day, Ashley, my sister, and I decided to take my mom out before my flight left to celebrate early. We ate Thai food and Cold Stone near the airport, and then made our way into SeaTac’s curly parking structures. Aside from almost forgetting my radar detector (a critical tool for cross country drives) in my car, and struggling saying goodbye to my family, things went very smoothly. SeaTac only had one security checkpoint open in the entire airport, so security was very slow. I am sitting at very rainy JFK, stubbornly refusing to pay $10 for a day-old sandwich and sipping a Dunkin’ iced coffee. My flight to Maine boards in half an hour. 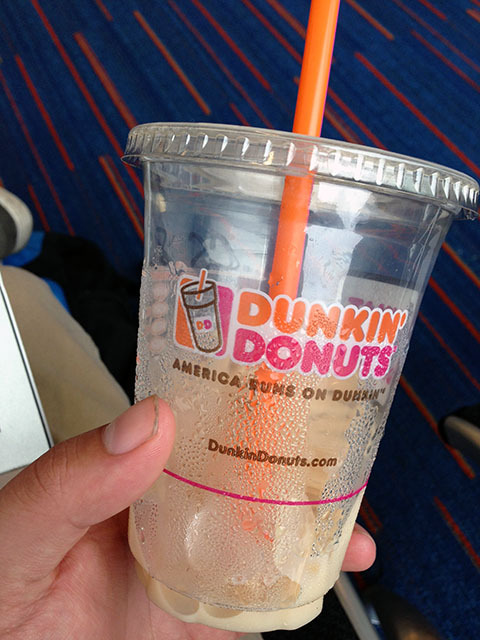 One of the best parts of any East Coast trip, Dunkin’ Donuts iced coffee. This was only $3.